The tagine--sometimes spelled tajine--is the traditional clay cooking pot used by North African cooks to conjure up deliciously spiced, slow-cooked stews and braises. It can be used to make both tender meat dishes and fragrant vegetable concoctions. Both traditional clay and modern tagines, made from a variety of materials, share the same design--a shallow base with a tall, curved, cone-shaped lid. Understand the design. All tagines have a distinctive shape--a shallow bottom with raised sides and a curved, cone-shaped top that condenses cooking vapors, keeping the dish moist as it slowly cooks. 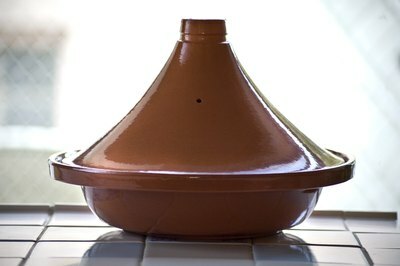 Some tagines have an opening at the narrow top of the cone, others do not--the hole helps steam escape in tagines with a tight-fitting lid. Consider clay. Traditional cooking tagines are made from clay, sometimes simply glazed, while others are decorated with colorful Moroccan-style motifs. The clay gives dishes an earthy flavor. There are also decorative ceramic vessels that are designed simply to be used to present dishes, not to cook them. 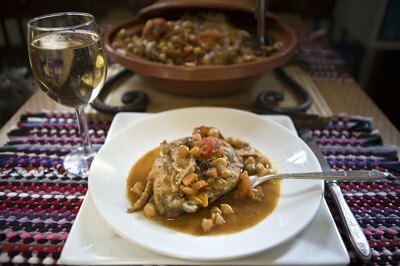 Be sure your tagine is meant for the oven if you plan to cook with it. Opt for convenience. Modern tagines are made from cast iron, porcelain-covered cast iron and stainless steel. They often cost up to three or four times more than a traditional clay tagine; however, they are easier to use since they can move from stovetop to oven and take higher heat when browning ingredients on the stovetop. 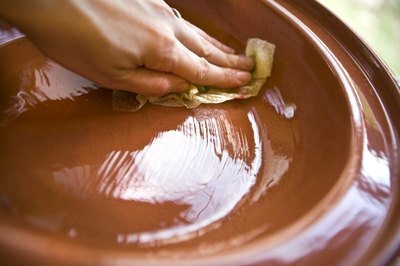 If traditional is your choice, you must cure your clay tagine by soaking it in water for at least an hour, then rubbing a small amount of olive oil over the interior. 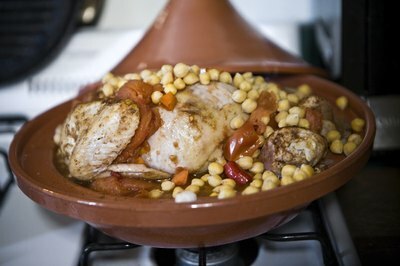 The tagine is then placed in a cold oven which is then set for 350 degrees Fahrenheit for two hours. 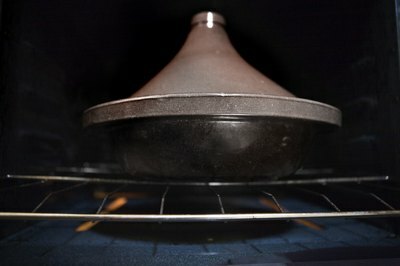 Some cooks use a heat diffuser with their clay tagine when cooking on the stovetop. Some tagine recipes call for ingredients to be layered in the bottom of the tagine, the cover put in place and the tagine carried carefully to a pre-heated oven for a long, slow cooking process. Typically, a small amount of olive oil is poured into the base of the tagine, then ingredients are layered with the more robust and sturdier ingredients going in first. Spices are then sprinkled over the ingredients, plus olives or preserved lemon, very common ingredients in North African cooking. Other recipes begin on the stovetop, caramelizing meat or hearty vegetables like carrots much like a traditional stew recipe. Other ingredients are then layered on top, spices added, plus a small amount of liquid to help create the sauce. Cooking continues on a low heat on the stovetop, or the dish can be transferred to a low oven for a long braise. Patience is essential for tagine cooking. The whole point of the tagine's design is to capture aromatic condensation, allowing the complex, spiced layers to merge into a delicious concoction. 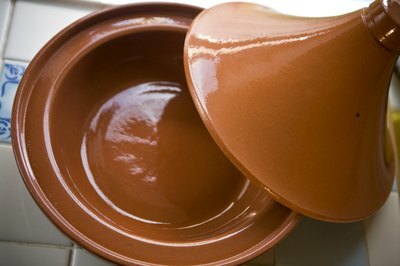 Do not try to speed the process by raising the heat, especially if you are using a clay tagine, which can crack if the temperature is too high. Serve your tagine dish with a flourish, leaving the cone-shaped lid in place until you place it on the table in front of your guests. Lifting the cone will release a cloud of aroma from the wonderful mix of spices and unique ingredients like preserved lemon and fresh olives. If you plan to use your clay tagine frequently, you will not need to re-cure it, but if it sits in the pantry and is used only sporadically, cure it before each use. 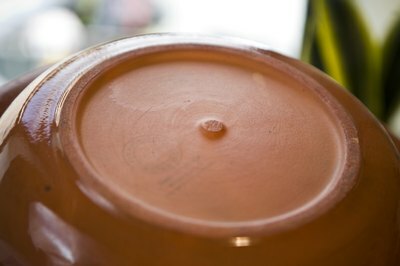 Never add cold ingredients to a hot clay tagine, or vice versa--the clay can crack. If you have difficulty lifting heavy cooking pots, consider a modern tagine with handles.